“So far the universal Church has made no official pronouncement regarding the use of electronic tablets in the liturgy. At least one cardinal, celebrating in his cathedral, has publicly used a tablet in lieu of a missal, but this does not constitute official ratification. In contrast, a recent statement from the bishops of New Zealand said that tablets should not be used for Mass and other public rituals. “Hence what I say has no official standing whatsoever. I limit myself to what I consider to be the liturgical principles involved. “With respect to using phones or tablets I do not see any great difficulty in a priest or anybody else using these instruments to pray the breviary, especially while traveling. “With respect to using a tablet to substitute the missal, lectionary and Book of the Gospels at Mass I would be much more hesitant. “On the one hand, it can be argued that the liturgical books, like any other book, are a means of conserving and transmitting information. In this sense the tablet fulfills the same function as the printed page but with some added advantages. For example, the tablet can contain all the ritual books in one place, and it allows the celebrant to switch the text from one language to another as needed and adjust the letter size to his own comfort level. “On the other hand, there is a principle which, while not essential to liturgy, should be weighed very carefully before using such instruments. “The Church has traditionally reserved the objects used in the liturgy exclusively for the sacred functions. Because of this, these objects generally receive a blessing which separates them from all other uses. One does not use a blessed chalice for domestic purposes; nor would a priest drive around town in alb, stole and chasuble. The reason for this is not the impracticality of the action but because such sacred objects are reserved for a specific time, place and function. “Likewise the books used in the liturgical celebration are usually blessed and reserved for sacred use. They are also printed and bound in a format which underlines their holy purpose. “Tablets, however, by their very nature, are capable of multiple uses. There is something incongruous in using a tablet as a missal or a lectionary and shortly thereafter utilizing it to respond to e-mail, surf the web, or download a movie. “The Book of the Gospels is one case in which I believe that norms exist that apply to our question. The General Instruction of the Roman Missal, No. 120d, specifies that only the Book of the Gospels, and not the lectionary, can be carried in the entrance procession and placed upon the altar. This distinction would certainly hold for a multiuse tablet, and thus I think we can say that the norms preclude carrying a tablet in procession, laying it upon the altar, and incensing it. “It is possible to speculate that eventually someone could develop a tablet for exclusively liturgical use with an appropriate design and no other programs installed. That might change the terms of the debate. “Until such a time arrives, I think it best to avoid using such instruments so as to maintain that sacred distinction of the liturgy from the humdrum of ordinary activities. With respect to praying the Divine Office, as mentioned above I see no particular difficulties and many advantages. 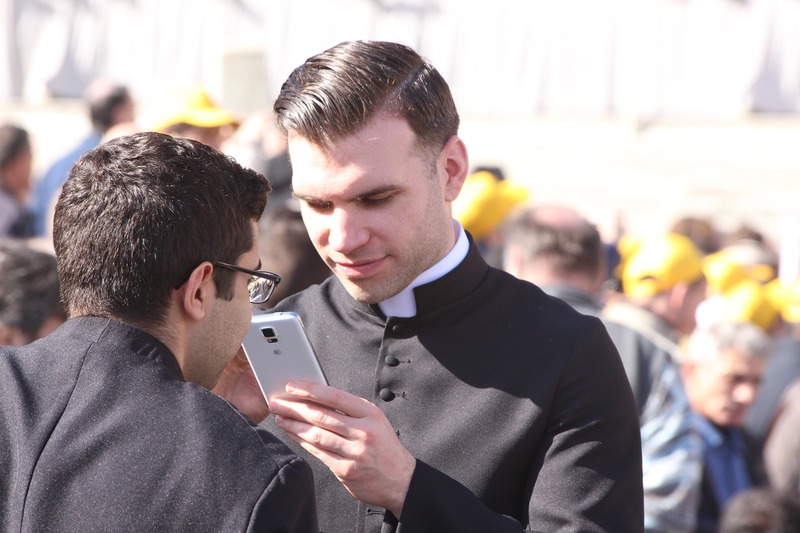 It is not clear, however, if the priest can fulfill his obligation to recite the breviary by simply listening to it recited on one of innumerable apps. In a formal response the Congregation for Divine Worship on Nov. 15, 2000, clarified some issues with respect to the obligation to the Liturgy of the Hours (Prot. No. 2330/00/L). This unofficial English translation was published by the liturgy office of the U.S. bishops’ conference. “The integral and daily celebration of the Liturgy of the Hours is, for priests and deacons on the way to the priesthood, a substantial part of their ecclesial ministry. “Only an impoverished vision would look at this responsibility as a mere fulfilling of a canonical obligation, even though it is such, and not keep in mind that the sacramental ordination confers on the deacon and on the priest a special office to lift up to the one and triune God praise for His goodness, for His sovereign beauty, and for His merciful design for our supernatural salvation. “Along with praise, priests and deacons present before the Divine Majesty a prayer of intercession so as to worthily respond to the spiritual and temporal necessities of the Church and all humanity. “In effect, even in similar circumstances, these prayers do not constitute a private act but rather form part of the public worship of the Church, in such a way that upon reciting the Hours, the sacred minister fulfills his ecclesial duty: the priest or deacon who in the intimacy of the Church, or of an oratory, or his residence, gives himself over to the celebration of the Divine Office effects, even when there may be no one who is accompanying him, an act which is eminently ecclesial in the name of the Church and in favor of all the Church, and inclusive of all humanity. The Roman Pontifical reads: ‘Are you resolved to maintain and deepen a spirit of prayer appropriate to your way of life and, in keeping with what is required of you, to celebrate faithfully the Liturgy of the Hours for the Church and for the whole world?’ (Cf. Roman Pontifical, Rite of the Ordination of Deacons). While it is not stated with total clarity, I believe that the above documents imply that those who have the obligation to say the office should do so integrally. It should also be done personally which includes community recitation, with a single companion or individually. This was the opinion of most experts in liturgical law before the council. For example, Father E.J. Quigley’s 1920 study on the breviary from the prospect of moral theology said the following. The above work attempts to determine the grade of sin involved for failing to pronounce well or for interrupting the recitation, but we have omitted these references since current canon law speaks of a grave obligation to be faithful to this commitment but no longer mentions mortal or venial sin. This is in line with the code’s general criteria to not formally oblige ecclesiastical precepts under pain of sin. “Question #2: Is the obligation sub gravi extended to the entire recitation of the Divine Office? Therefore, in conclusion, I believe that in general terms the use of an app that recites the Divine Office is insufficient to fulfill the obligation acquired at ordination. I admit, however, that my opinion is an inference and that there is no official stance one way or the other, and such an application might receive official approval someday. Such applications may be profitably used by any member of the faithful who is not obliged to recite the Divine Office but who desires to do so. I believe it is also a legitimate option for priests and others who would normally be obliged to pray the Office but who would be dispensed due to meeting one of the conditions mentioned above in the official response.